How brand precision marketing works for lawyers and legal groups. 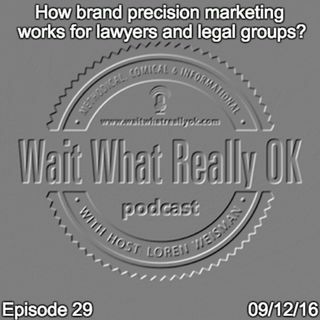 Wait What Really OK Podcast Episode 29 hosted by Brand Precision Marketing Strategist and Counselor, Loren Weisman, shares a few pointers, tips and tools to apply a better approach for marketing when it comes to the legal beagles. Brand Precision Marketing works with Lawyers and Legal groups when the idea of telling people they can trust you is exchanged with an editorial calendar designed to share content, enhance ... Más informaciones the brand and compound the recognition and optimization. The information, recognition, and engagement in free tips, hints, tricks and first steps will make the conversion to clients that much easier as those that already have been clients will continued to stay connected with you. This works worlds better than continually requesting trust, pushing the sell and using fear as a factor to bring in a client. Podcast Blog Supplement for Episode 29 of the Wait What Really OK Podcast with Loren Weisman. Podcast Link Supplement for Episode 29 of the Wait What Really OK Podcast with Loren Weisman. Brand Precision Marketing and playing well with other consultants. Podcast Video Supplement for Episode 29 of the Wait What Really OK Podcast with Loren Weisman. Podcast Photo Supplement for Episode 29 of the Wait What Really OK Podcast with Loren Weisman.